A friend who's been to Cuba suggested that "for many Cubans, food at the moment is state-issued ham sandwiches, which you could approximate with some layers of wet cardboard standing in for bread, and finely shaved erasers for the ham, all encased in a blister pack of clear cellophane." Our guest Tennessee reported that by far the most disgusting food she's had in her life was "street pizza" in Havana, during her time as a student there. Fortunately, we were able to lean instead on the culinary traditions of families who've left Cuba. 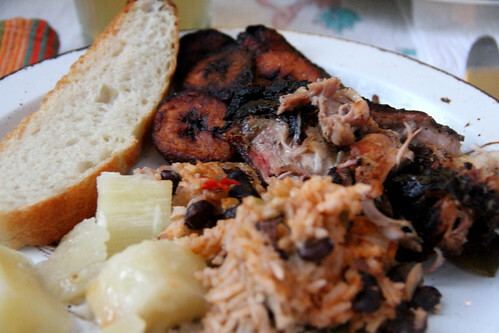 In fact, the structure of the meal was suggested by my colleague Wendy, who's from a Cuban family in South Florida. (Note the distinct lack of vegetables. Apparently this is very authentic.) 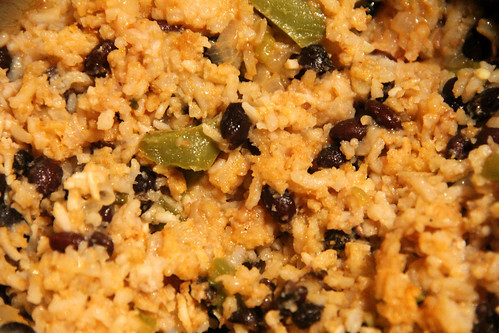 Our guest Alex agreed that this food reminded him of what his Cuban mom makes. Fortunately, we didn't have to contend with rationing, so this turned into quite the feast. The five mile bike ride back from the Food Bazaar supermarket was quite the haul, with a nine-pound pork shoulder and a three-liter jug of olive oil anchoring my saddlebags. 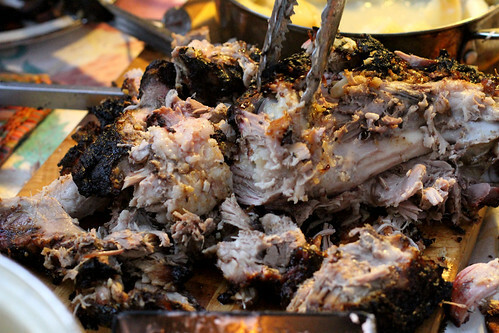 Like I imagine many things in Cuba to be, the preparation was long and slow, folks trickled in as the smell of slowly barbecuing pork roasted through the house, and the payoff was lovely. 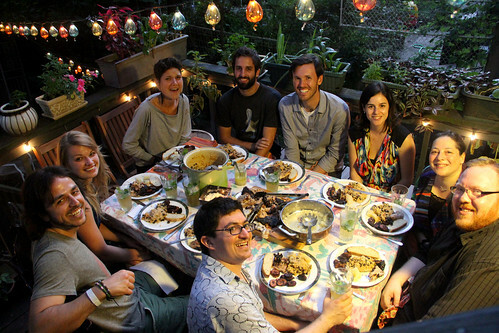 Our guests were Sam, Beni, Nathalia, Ian, Alex, Tennessee, Kirsten, and Demián. Sam was eager to mix some cocktails, and Laura and I were fully in support. As a major sugar producer for centuries, Cuba also developed a substantial rum industry. Pretty much everywhere besides the US they enjoy Havana Club and other Cuban rums; even Bacardi was based in Havana before they absconded with their yeast to escape nationalization and set up shop in Puerto Rico. 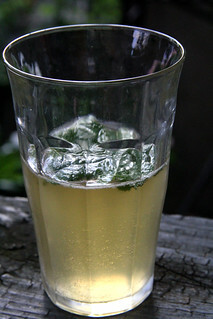 We started out with mojitos, of course, with fresh mint from the patio and a simple syrup made of demerara sugar. Now, I order mojitos frequently at bars, and it's fair to say I've had dozens if not hundreds in my life. This was one of the best. Not too minty, not too limey, and rather than being pure sweet, the richness of the demerara really held it together. Check out the recipe at the end. The other drink Sam made was also rum-based, but in a very different direction. Made with orange liqueur, (homemade) grenadine, vermouth, and aged rum, it's called El Presidente, but I think of it as a Rumhattan. The vermouth balances the sweetness, and provided it's made from quality ingredients, which this sure was, it's a really complex drink worth lingering on. 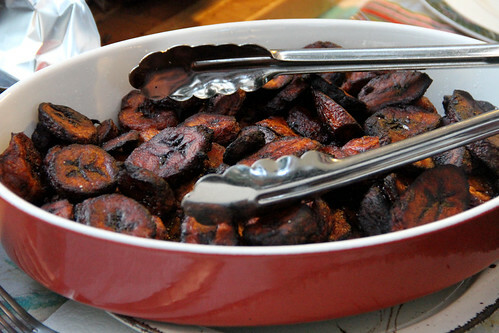 Baked plantains are definitely easier, faster for such a big crowd, healthier, and less labor intensive. But there's nothing like coins of super-ripe plantains shed of their nearly-black skin, cut on the bias, fried to within a minute of burning, and touched with a hint of salt. No matter how many of these I make, they always disappear. The planning for this dish started many months ago, when I wantonly suggested to a friend that I could build a pit in her backyard and roast a whole 80-pound pig in it. Among the many reasons this was a poor idea is that she's vegetarian! 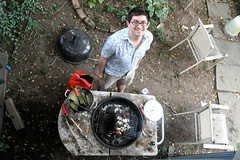 Anyway, I was happy to learn that you can do something similar with just part of a pig, hence the nine-pound shoulder. I hadn't once done a true charcoal this summer, and I'd be chagrined to miss this opportunity. 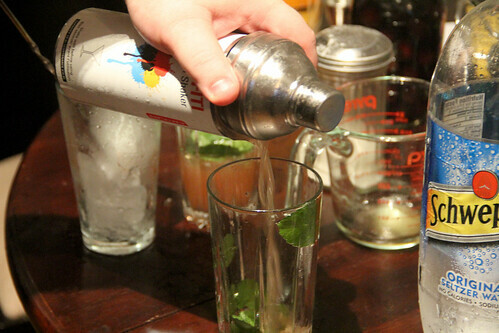 It started the night before with a mojo — not to be confused with mojito! — of sour orange juice, lots of olive oil, a smattering of onion, and 30(!) cloves of garlic. (Note that if you use fresh sour oranges for this recipe, it takes a lot of them! I got barely a cup from nine whole fruits, and filled the rest with lemon and lime juice.) I stabbed the shoulder with a knife a few hundred times, especially in the skin, to let the marinade in. 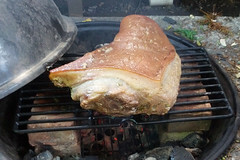 The pork turned out simply delicious; two days later we're still eating it for every meal, like a Thanksgiving turkey. It's a really cheap cut of meat (usually under $2/pound), and you can make it easily in the oven and not be fussy on the grill, so if you've got time and a crowd to feed, consider it! I actually made two loaves; we used the second today to make a sandwich with some leftover pork. (And yes, we put pickles and other Cuban sandwich accoutrements on it.) Yum. 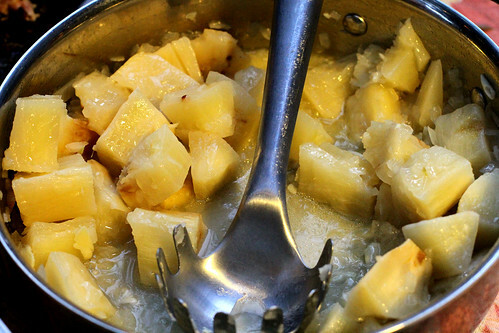 The same thing as manioc and cassava, which we've encountered many times. I think this is my favorite preparation of this starchy, bland root: covered in a sauce of olive oil, citrus and garlic! Tres leches refers to a dessert that has evaporated, condensed, and fresh milk. We made a tres leches rice pudding for Costa Rica, and a tres leches cake is to Latin America what tiramisú is to Italy: a baked good drenched in sweet liquid. 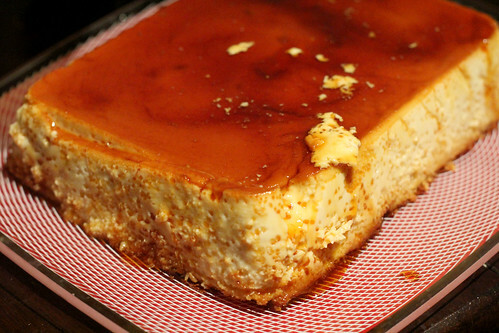 Anyway, hold onto your arteries, because this flan is cuatro leches, courtesy of cream cheese! 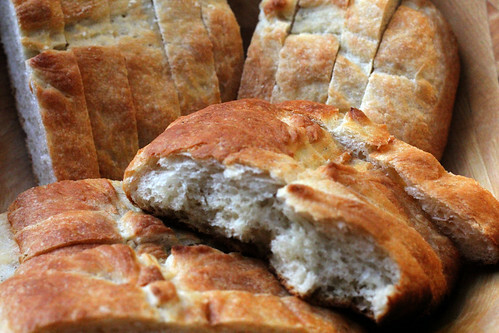 Probably non-traditional, but really, really tasty. As with the mojitos, the sugar in the caramel is demerara, which further enhances the rich, nutty flavor. And the flan itself was just great, perfectly set, not too sweet, just darn tasty. It shouldn't surprise you that the Cuban music was top-notch, and thanks to our guests who'd been to Havana and beyond, we heard several stories of life in a country so close yet so far, such as the tradition of pouring a little splash on the ground from a newly-opened bottle for los santos. Next, we're heading to the hills for the Labor Day weekend, where we'll do our Czech Republic meal! Photos by Laura Hadden, whose love for Sam's mojitos knows no bounds. Stir with cracked ice and strain into a chilled cocktail glass, and garnish with an orange twist. 3/4 oz. simple syrup (we used demerara sugar, of course, and I think that really made the difference. I also made it "rich simple syrup", with a 2:1 sugar:water ratio.